Click on an image to launch the video training in YouTube. 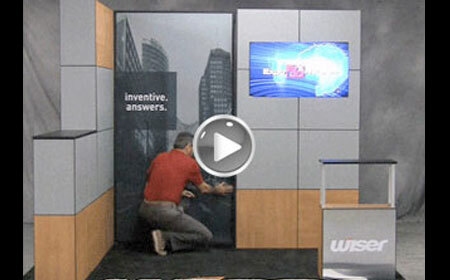 Lightweight, aluminum framework assembles with no tools. The wall is then covered with a series of 23" x 23" square Quads that attach with magnets creating a decorative grid of quadrants. Interchangeable Quads allow near limitless deisgn flexibility. Quads have built-in reveals giving MultiQuad a look that's unique to portable displays while reducing seam misalignment due to uneven trade show floors. 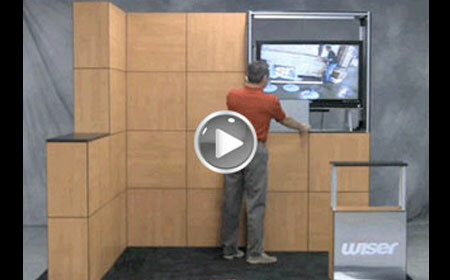 MultiQuad owners have virtually unlimited freedom in creating their exhibit. Choose from hundreds of looks, finishes and designs, including: Wood grain, backlit graphic, fabric, metal or textured finishes, any image or any color. Since Quads are lightweight and interchangeable, exhibitors can change the design or message in seconds by replacing or rearranging Quads -- even during a show! You can easily transform Quads and multiple Quad combinations into striking backlit graphics! 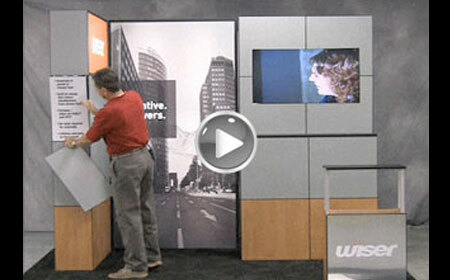 From back-lighting a single Quad to creating a big, seamless backlit 4’ x 4’ or 4’ x 8’ graphic, MultiQuad makes it easy. Backlit is a great way to draw attention to a prominent message or spotlight your company logo. 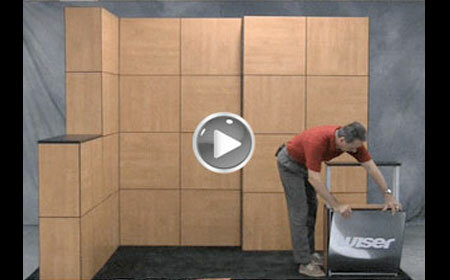 These following assembly steps make for a quick and easy setup of your MultiQuad exhibit. 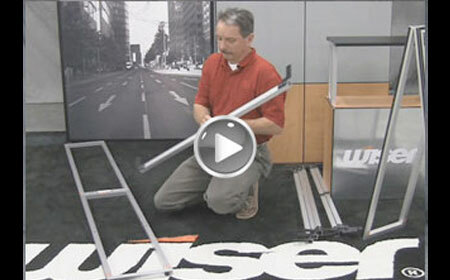 The lightweight aluminum framework easily assembles without any tools. The panel quadrants are then attached to the frame with magnets. The framework has four independently adjustable feet that allow the exhibitor to level the display even on uneven floors. The flexibilty of MultiQuad allows you to rearrange components to create new structures within minutes without the use of tools. 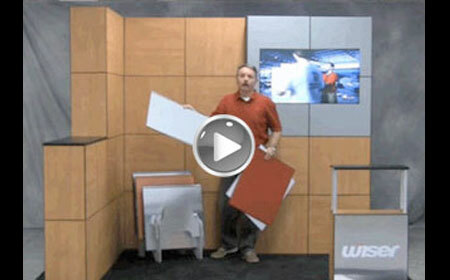 For example you can move a forward facing shelf area and turn it into a laptop counter. 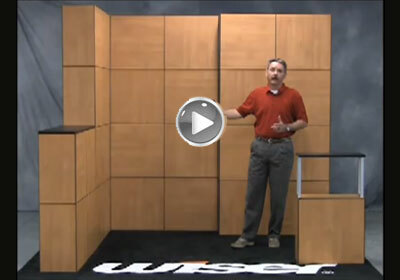 MultiQuad is a fluid exhibit system that can change and grow. It is just as easy to make MultiQuad different for each show as it is to keep it the same. 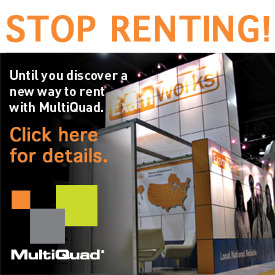 As your company grows, MultiQuad can grow with you. Side Quads are 12.125" x 23" and are used on the narrow side of MultiQuad Standard frames, counters and podiums. Side Quads vary from Quads in size only. Side Quads can be any color or finish just like standard Quads. 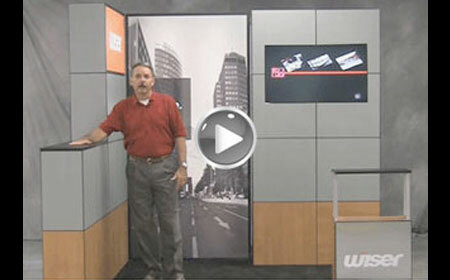 Add video technology to your MultiQuad to increase your visibility with your trade show audience. The lightweight monitor mount fully integrates with your display graphics so only the monitor is visible for a clean finished appearance.